Glass is basically impossible to light directly when it’s perfectly clear, as is often the case with drinking glasses. Throwing more light at it doesn’t really do anything. It all just goes through the glass, lighting whatever’s behind it. This is why it’s so much easier to just light the stuff that’s behind and around it to define the shape and form of the glass. In the video, Jay P shows off two quick setups for lighting the environment around the glass to make the glass stand out from the background and look great. 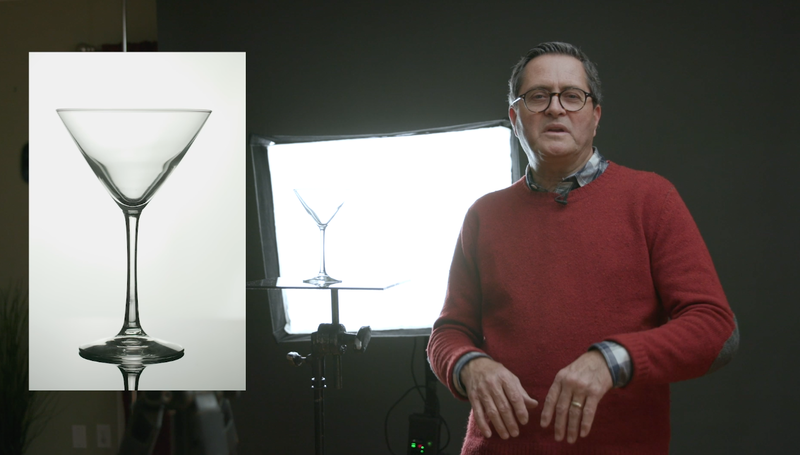 Jay P uses Aputure 300D and 120D continuous LED lights for the demonstrations, as continuous lights are more suitable for video, but the same principles also apply when using flash. 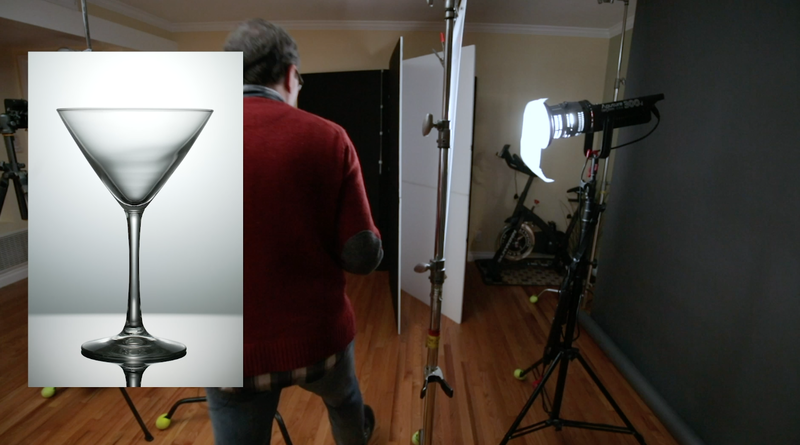 For the first setup, Jay P projects a narrow beam of light onto the background directly behind the glass. This technique helps to control the light and stop it spilling onto the environment outside of the shot to stop it showing up as refractions through the glass. The last thing you want is to see the rest of the room lit up down the sides of the glass. The white background is flanked on either side by black card for this purpose, to help bring those “shadow” edges in the glass as dark as possible, separating it from the bright white background. The second setup is quite interesting, and helps to eliminate room light reflections even further. Here, instead of white card, a piece of translucent white plexiglass (perspex, acrylic, etc) is placed behind the subject, and a light is then placed behind that. In essence, it’s backlighting the background. This is a similar sort of principle to shooting portraits with something like the Lastolite Hilite but on a smaller scale. Except, you don’t need the background to be perfectly and evenly lit, and you don’t need to add more light from the front, as your subject is glass and not a person. If you don’t want to order a big sheet of acrylic as a background, you can also do it with just a regular softbox. You’ll want to be careful with your light here, and using the acrylic setup above. With both setups you are essentially shooting a light source. So, you’ll want to dial your light down, lower your ISO, make your aperture smaller and speed up your shutter speed to ensure it’s not flaring into the camera. This really is like the Lastolite Hilite I mentioned above, and I’ve done this in the past for headshots, too, too, using a strobe in a 4ft octabox as a pure white background with a second light on the subject’s face. It’s a great technique, and many of us already own softboxes. 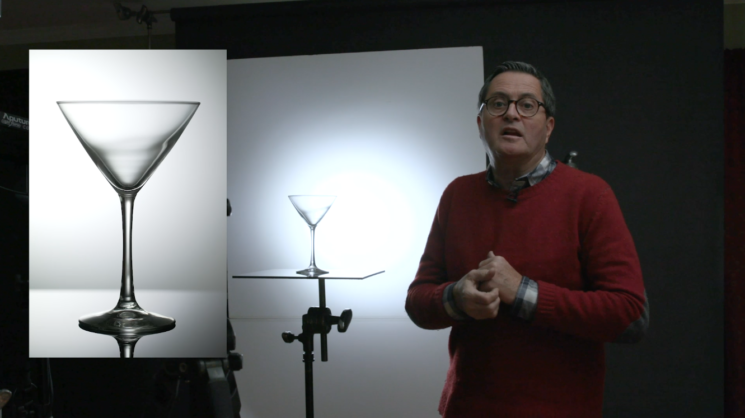 While the video offers some great tips, this is only the beginning when it comes to photographing glass. Once you start dealing with coloured glass, semi-opaque glass, or even clear drinking glasses and glass jars containing liquids or other materials, it starts to get even more tricky. Hopefully, Jay P will do a follow up to this video at some point to explore those more challenging areas of glass photography in more depth. Because lighting glass is a whole lot of fun to experiment with! If you haven’t seen the rest of Jay P’s Laws of Light series, he has a full playlist of all the videos so far, for you to watch at your leisure. What’s your favourite tip for photographing glass?